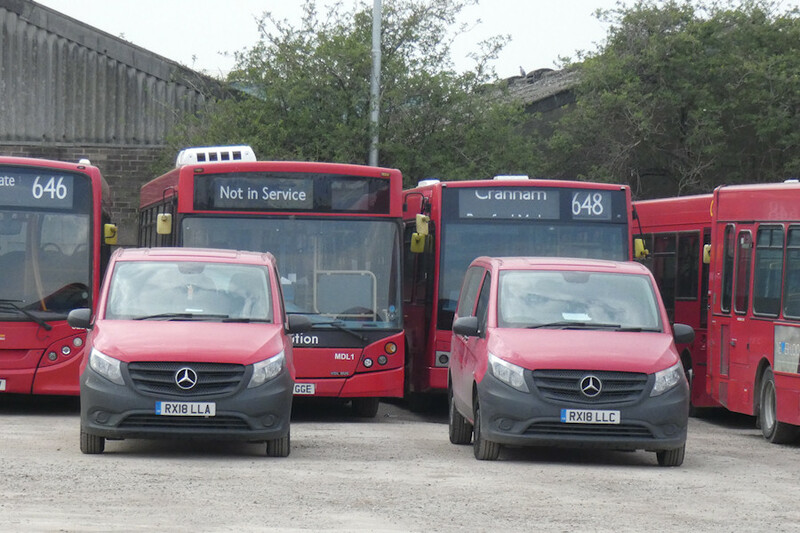 Details: As well as a display of buses at Barking Garage, and various local routes operating with RT-class buses, the RT 40th anniversary event on 30th March 2019 featured a small array of preserved buses at Go-Ahead's River Road Garage. This was not in the garage itself but in a large yard to the south east of the main yard. Access was from Creek Road instead of River Road, although I forgot to check whether there was a connection between the two yards. The elusive engineering van was hiding in the main garage, meaning only the crew ferry minibuses could be photographed. Seen in the 'new' yard were two of the RX18LLx batch. RX18LLA was new here but was operating from Orpington earlier in the month. In the background is an interesting array of single-decker buses, including the unique MDL1, an MCV-bodied VDL SB180.